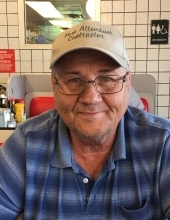 Paul Philip Turner, age 70 of Carrollton, passed away March 26, 2019. He was born April 22, 1948 in Douglasville, Georgia, son of the late William Oliver Turner and Ovaline Hesterly Turner. He worked for Danny Davis Trucking for more than 15 years and was a member of Midway Church. In addition to his parents, he is preceded in death by his sister, Patricia Wilkes. He is survived by his wife, Carolyn Faye Trotti Turner of Carrollton; step-mother, Marsha Zapp; children, Paul and Wendi Turner of Villa Rica, Chris and Susan Turner of Carrollton, Michelle and Delbert (Debo) Cash of Carrollton, Jaime Harvey of Tennessee, and Sabrina and Trint Grimsley of Carrollton; brother, Edward Turner of Florida; sixteen grandchildren, and one great grandchild. Funeral service will be conducted Friday, March 29, 2019 at 2:00 PM from Martin & Hightower Heritage Chapel. In keeping with the family’s wishes, his body will be cremated after the service. The family will receive friends Thursday, March 28, 2019 from 5:00 PM until 8:00 PM at the funeral home. In lieu of flowers, the family requests that love contributions be sent to Carolyn Turner at P.O. Box 215, Carrollton, GA 30112. Messages of condolences can be sent to the family at www.martin-hightower.com . To send flowers or a remembrance gift to the family of Paul Philip Turner, please visit our Tribute Store. "Email Address" would like to share the life celebration of Paul Philip Turner. Click on the "link" to go to share a favorite memory or leave a condolence message for the family.